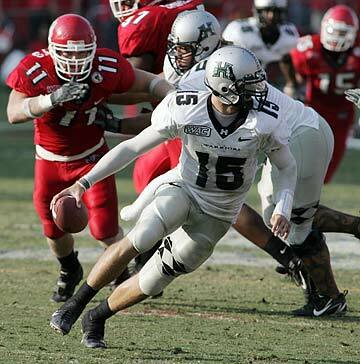 Hawaii quarterback Colt Brennan scrambled as Fresno State's Tyler Clutts pursued yesterday. FRESNO, Calif. » Colt Brennan didn't spend much time in Fresno this weekend, but he made himself quite at home anyway. When the Hawaii football team arrived at its hotel Friday evening, mom and dad and even his dog were there to greet the Warriors quarterback, who then headed straight for the nearest In-N-Out Burger. And once he arrived at Bulldog Stadium yesterday, he turned the normally hostile surroundings into a personal playground in helping the Warriors to a surprisingly easy 68-37 rout of Western Athletic Conference rival Fresno State. "My family was here, best friends from third grade, they all made the drive up," said Brennan, a junior from Irvine, Calif. "Today's a special day for me but also for this football team." Brennan's father, Terry, said a group of about 35 friends and relatives made the trip to Fresno to watch him play, and his son certainly didn't disappoint. After Brennan threw two incomplete passes on Hawaii's opening drive of the game, only five more of his throws touched the turf, as he finished 32-for-39 for 409 yards and five touchdowns. Backup Tyler Graunke went 5-for-5 in his one drive of the game for a combined completion rate of 84 percent. "We've worked hard to get it to this point and Colt is seeing things and executing, and when that happens we're going to move the ball," UH coach June Jones said. Brennan's percentage (82 percent) fell just short of the school record of 83.3 (with a minimum of 20 attempts) set by Tim Carey in 1997 when he went 25-for-30 against Cal State Northridge. His accuracy yesterday increased his season mark to 73 percent with 23 touchdowns against just five interceptions. He already owns the UH season record, hitting 68 percent of his throws last year. "He's just getting better," Hawaii quarterbacks coach Dan Morrison said. "It's so hard to tell where he's going to go because the expectations are rising so rapidly. His accuracy and his understanding of things and how quick he gets the ball out is growing by leaps and bounds. "He's the most accurate I've ever been around and he handles all environments real well, daytime, nighttime, at home, on the road." The Hawaii offensive line gave Brennan ample time to locate the Warriors receivers, who found soft spots in the Fresno State secondary with regularity. Four receivers caught touchdown passes and five recorded gains of at least 35 yards. "Those are some gifted receivers he's got, and then the offensive line, what can you say?" Terry Brennan marveled. Colt Brennan was also the Warriors' leading rusher yesterday, picking up 43 yards on the ground while being sacked just once. The Warriors were scheduled to return home last night and will return to the mainland in a few days for Saturday's game at New Mexico State, where Brennan's parents and siblings will again be watching. "This offense is growing every week," Brennan said. "We're not happy with where we're at. We're always trying to get better. We come out here and just do what we do and the stats just come out of nowhere. The efficiency and execution level are real high, so it's just giving us great stats."